On February 16, 1970 a pipe bomb filled with shrapnel exploded on the ledge of a window at the San Francisco Police Department’s Golden Gate Park station. Brian V. McDonnell, a police sergeant, was fatally wounded in its blast; Robert Fogarty, another police officer, was severely wounded in his face and legs and was partially blinded. No one was ever charged with this crime but it is considered to be the work of the Weather Underground. You know that group that Bill ”I didn’t bomb enough” Ayers used to be in charge of. And you do know who Aryers is. Former terrorist (who never repented and was proud of his work), Professor in the College of Education at the professor in the College of Education at the University of Illinois at Chicago, Fugitive from the law, Radical liberal, and oh yes, a good friend of President Barack Obama. That Bill Ayers. But that is to change. Although the Feds couldn’t get charges to stick to him, or his wife Bernardine Dohrn (funny how as a radical and communist they didn’t mind using his daddy’s money to get a good attorney to get them off on a technicality) they just might have something now. A San Francisco police union has accused former domestic terrorist William Ayers, co-founder of the Weather Underground, and his wife in a 1970 bombing that killed one sergeant, the San Francisco Chronicle reports. The union, in a letter to a conservative organization lobbying for arrests in the case, accused Ayers and wife Bernardine Dohrn of bombing a city police station. On Feb. 16, 1970, a bomb placed on a window ledge of Park Station killed Sgt. Brian McDonnell and injured eight other officers, the Chronicle reported. The union said it had not been in contact with investigators nor did it have new evidence, but it cited Larry Grathwohl, who works with the conservative organization America’s Survival of Maryland and claims that he infiltrated Weather Underground as an FBI informant and heard Ayers confess, the Chronicle reported. “There are irrefutable and compelling reasons to believe that Bill Ayers and his wife Bernardine Dohrn … are largely responsible for the bombing of Park Police Station,” the Feb. 24 letter reads, according to the Chronicle. Remarks of Larry Grathwohl, at America’s Survival, Inc., “Justice for Victims of Terrorism” conference, March 12, 2009. One of the issues in Washington, D.C. for President Barack Obama is what to do with the terrorists being held at Guantanamo Bay, Cuba, after he issued an executive order to close the detention facility. The question we want answered is why terrorists close to him politically have escaped justice for the 1970 bombing of the Park Police Station in San Francisco. We believe the Department of Justice should make available all the evidence in this case to local authorities and law enforcement officials. I was in the Weather Underground as an informant/infiltrator for the FBI. I have testified, spoken, and written about the involvement of Weather Underground terrorist leaders Bill Ayers and Bernardine Dohrn in that bombing. That bombing on February 16, 1970, took the life of Sergeant Brian V. McDonnell. There is no statute of limitations on murder. I remember the Sunday morning in January of 1970 when it was obvious to me that the three FBI agents were upset. They wanted to know when the bombings of the Detroit Police Officers Building and the 13th precinct would take place and which members of the Weather Underground would be assigned to do it. Bill Ayers had debriefed me regarding every aspect of the plans we had developed before telling me I was being reassigned to Madison. Bill’s two major requirements were that the bombs go off at the same time and that the greatest number of police officers would be killed or injured. Both bombs were to contain fence staples or roofing nails to ensure this effect. Bill Ayers didn’t care if innocent people were also killed or injured. Bill had even gone so far as to tell us that the bomb at the 13th precinct should be placed on a window ledge. Both bombs were set four days later than originally planned but both also failed to detonate due to failures in the timing devices. 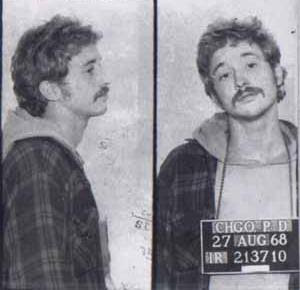 I wouldn’t see Bill Ayers again until February of 1970 in Buffalo when I returned from a day of obtaining death certificates for use in creating phony ID’s for fellow members of my new cell of Weatherman terrorists. As soon as we had all assembled, Bill began a criticism session of myself and my associates for having spent too much time preparing for actions (bombings) and not doing anything. He reminded us of the commitment all of us had made to the overthrow of the U.S. government at the National Council Meeting in Flint the previous December and how our inactivity was harming the Cubans, the Vietnamese and the Chinese. Bill went on to describe how Bernardine Dorhn, a Weather Underground central committee member and considered the leader of the Weather Underground, had to plan and commit the bombing of the Park Station in San Francisco. This bomb contained fence staples and was placed on a window ledge during a shift change ensuring the presence of the greatest number of police officers and the greatest possibility of death and injury. Several Police Officers were injured and one, Sergeant McDonnell, was killed by fence staples used in the bomb. He was in the hospital for two days before he succumbed to his injuries. At the National Council Meeting which took place in Flint, Michigan, in late December of 1969, Bernardine Dorhn had praised mass murderer Charles Manson and said, “The Weatherman is about a communist revolution to destroy the white racist’s society and establish a democratic centralist’s government”. Furthermore, Bernadine wanted everyone at the council meeting to, “bring the war home and off (kill) their parents”. There is no Statute of Limitations on Murder by either the Federal Authorities or the State of California. And the evidence presented in this new indictment will not carry the stain from the failed case the government had at the time. J’accuse you Professor Ayes and your wife Bernardine Dohrn of the woeful taking of a life. No cause you could give would justify that crime. You tried to destroy the United States, hand it over to the governments of Cuba, North Vietnam, Communist China and the Soviet Union. You wished to murder 25 million Americans who didn’t believe what you did. All you did was to kill one police officer and wound another. Both the State of California and the Federal Government impose the Death Penalty for the murder of an officer of the law. You both have the means to hire the best attorneys in the nation. You are going to need them. For this time, I pray that you get the maximum sentence under the law. And if your good friend and neighbor Barack Obama grants you clemency or even worse, a pardon. He will have cut his throat politically. You have had your fun, Professor Ayers. Now it is time to pay the price for that fun. Filed under: Bill Ayers, San Francisco, Terrorism, Weather Underground |	Comments Off on J’accuse!